The Castoroides (cass-tor-oy-dees) or Giant Beaver is one of the creatures in ARK: Survival Evolved. Castoroides itself doesn't seem to realize how dangerous the island is. I don't know if it's simply too dumb to notice the dangers, or if it just doesn't care...but Castoroides happily goes about its day playing in the water and gnawing on wood. Wild Castoroides will build dams containing large quantities of Wood, Cementing Paste, Rare Flower, Rare Mushroom, and Silica Pearls. Giant Beavers are very protective of their dams and will come to their defense should anyone threaten them. One to three beavers have been noted around a dam site. See Giant Beaver Dam for a map of locations. The dams will never be re-filled, be sure to destroy them after looting. Castoroides will not attack any entity (whether it be player or creature) unless aggravated to do so. 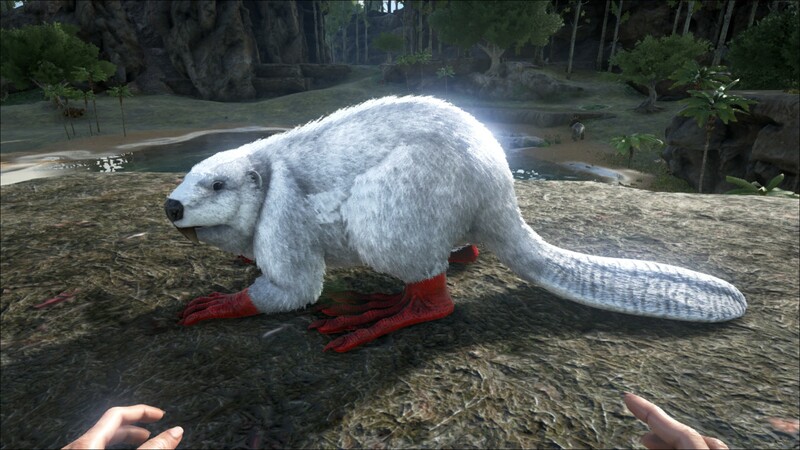 Often, Giant Beavers who reside close to swamps will be forced to defend their territory and fight against wandering Dilophosaurs and invading Titanoboas. Sometimes they can be seen grouping up against larger predators like Carnos or swarms of smaller predators like Raptors and Terror Birds. If a player attacks one, the entire Giant Beaver population in the immediate area will attack. Unless injured by the player, a player can get as close as they would like to a Giant Beaver. If the ability to kill a Beaver in a single hit by a powerful mount is available, doing so will not make the other Beavers attack. The Castoroides is a giant species of beaver found commonly in the rivers and ponds of the island's interior. It also appears at the Hidden Lake. It has waterproof fur and a flat tail for swimming. With their powerful jaws and sharp incisors they can gnaw through many of the trees found throughout the island, using the resulting wood and other raw materials to construct their dams. This section displays the Castoroides's natural colors and regions. For demonstration, the regions below are colored red over an albino Castoroides. The colored squares shown underneath each region's description are the colors that the Castoroides will randomly spawn with to provide an overall range of its natural color scheme. Hover your cursor over a color to display its name and ID. For example, "cheat SetTargetDinoColor 0 6" would color the Castoroides's "body" magenta. The Beavers are not hard to down, as it only takes around 9 tranquilizer darts to down a lvl 75, so just using darts while it's chasing you should work fine. You may also put it in a small taming pen or use Bolas on it. The Beavers torpor drops very rapidly so it is very important to fire tranquilizers in rapid succession and have a lot of narcotics on hand, as the tame is long and slow. This section describes how to fight against the Castoroides. Giant Beavers are actually very tough and deadly animals both in the water and out. They are surprisingly fast, and they do a lot of damage. Beware! Staying away and out of water can make the Castoroides an easy creature to knockout along with their decently low torpor, but need a fair amount of narcotics.You can walk backwards to avoid damage, but they will eventually catch up to you. Whatever you do, do not go in the water with an angry Giant Beaver, or it will likely kill you in seconds. If just trying to outright kill it, try using bolas and attacking from the sides or back with melee. Depending on the distance, use any ranged or any melee weapon to kill them. They are vulnerable to Bolas, which can make them an easy kill. If dealing with a group of them at close range, a Flamethrower can be ideal. A single Castoroides isn't a huge threat on its own, but being swarmed by a group of them (especially after going through a Giant Beaver Dam), can mean certain death for even a well equipped survivor. When unmounted, the beaver will float up to the surface unless they are following you. They cannot climb very well, so height might help a player in trouble. Gatherer: Castoroides gather wood very efficiently. While this is much easier when ridden, players without a Castoroides saddle can still take advantage of the wood-gathering ability by enabling the Castoroides to wander in a wooded area. It will gather wood on its own when it wanders near trees until it reaches 50% weight. For more immediate wood gathering without a saddle, the player can manually lead the Castoroides to trees by whistling for it to follow, leading it to a tree, then whistling it to stop. If the Castoroides is close enough, it will cut down the tree and collect the wood. Repeating this process can quickly gather lots of wood with minimal effort (Level up Weight and Melee Damage). Transport: Wood, Thatch, Fiber and Stone weigh less while being carried by the Castoroides. These resources weigh only 50% of their usual value (25, 1, 0.5, and 25 units per 100 pieces respectively). The Castoroides travels faster while swimming in many of ARK's waterways, making transport through rivers much more viable (Level up Weight, Stamina). Organic Craftsman: Once saddled, the Castoroides can be used as a Smithy, allowing for a mobile crafting wagon. (Level up Weight). 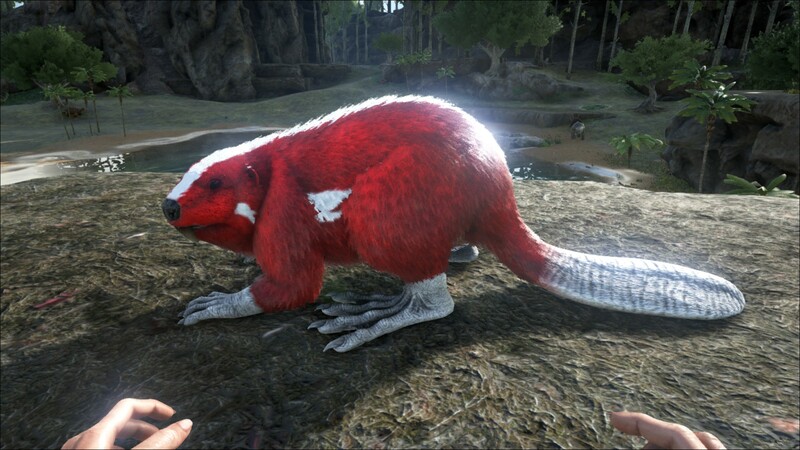 Resource Duo Strategy: If you have an Argentavis, it can be paired with the Castoroides to make a nice combo for wood gathering. You can carry the Castoroides with the Argentavis to a dense wood area, clear it out, and, as the Castoroides has a wood weight reduction, you can carry big amounts of resources with the Argentavis back to your base. This seems to be the most efficient way to gather wood. Castoroides will gather wood autonomously while on wander or if set to do nothing while a tree is very close to it. Castoroides will automatically cut trees when near them. Before the introduction of the Direbear and the Redwood Forests with an additional spawn area of the Megaloceros, hunting Castoroides was the easiest way to gather Pelt without entering the tundra. Keep in mind that these mammals are rather rare, however, and may be worth more alive than dead. In real life, Casteroides' incisors were much broader and thicker than modern beavers, so they would have been less effective at cutting wood. For this reason, many paleontologists believe they did not construct dams. The Castoroides has an oxygen attribute, but it never drains when the beaver is underwater. Thus, beavers are incapable of drowning. When riding a Castoroides in first person view, the camera is placed slightly behind where it should be as you can clearly see its saddle. A map of giant beaver dam spawn locations can be seen in the article Giant Beaver Dam. These locations are also where to search for beavers as beavers spawn in pairs around the dams.